I have been aware of and intrigued by Unread Records for around five years now. It's a small tape label here in Pittsburgh. They don't do a lot of advertising or promotion that I have seen. 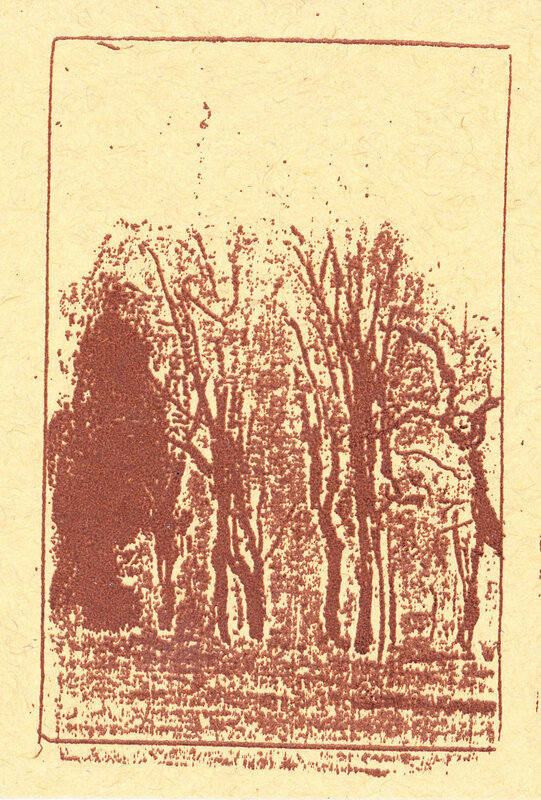 I first encountered the label when I saw a Swampwalk tape they put out at Roboto. My friend Stew also mentioned the label to me later, and I booked a show for someone who was friends with the owner. It's like little puzzle pieces put together. I do follow Unread on Facebook, but posts on there aren't always the most visible, as I'm sure you know. Anyway, this album was just released, and it looked pretty cool. Improvised guitar stuff is always interesting, and Unread puts out a lot of good stuff. 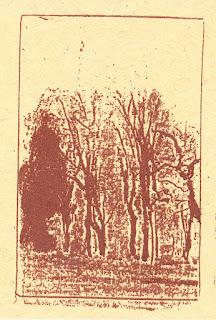 The cover art to Unread #231, Spring Suite by C. Worth, is a scraggly print of trees and bushes. There may be some beings in their somewhere, retaining a humanoid form in the barest sense. It's a very stark album cover, just two colors and very rough. There are no words on it. It's definitely very mysterious, though it's a little too basic. I suspect that it would look pretty good on a tape though, which is the original format. unread #231 by c. worth All the tracks on Spring Suite are untitled. The first track sounds like Eno's Music for Airports, a slower and calm guitar with slight reverb and chorus meandering. The second track is similar but a different melody; it's almost if it is a continuation, building on the previous track. There is a slight vibrato making this sound like a deconstructed surf song. The third untitled track is a little more chiming. The fourth track is more like a traditional song, slightly more dramatic, while the fifth one sounds almost like wind chimes. During the sixth piece, things get darker and uncertain. The seventh part continues in the more dramatic way, a sense of loss, some kind of growth. Part eight is really slow, the notes hanging about in uncertainty to come down into some kind of being. I really like the counterpoint of the deeper notes on this one. The ninth guy comes in more like a morning song, the morning after a dark night. There is some confusion and then a cascade of notes continue on their way. That cascade of notes had me very intrigued. The tenth song continues more into the morning. Track #11 reverberates it's way into some cool cave, the moisture visibly clinging to the walls. The final piece is a little harder and dramatic, ending theme to a film with scenes of a forest in Vietnam shot from helicopter. Spring Suite is uncompromising. It's basically one sound throughout. As such, it's kind of tough to listen to. No words to somewhat amorphous songs light as air makes it more of background musick. As I mentioned at the start, it's quite a bit like Ambient 1: Music for Airports; I feel the same about that album, and I think that Brian Eno does too. Spring Suite is a little too bare for me and a little too pastoral, so I will give it a Neutral.